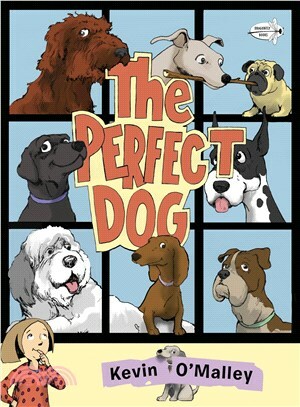 Fans of The Pigeon Wants a Puppy and Charlie the Ranch Dog will fall in love with this vibrant picture book about one girl’s quest to find the perfect dog for her family. When your parents say you can get a dog, you feel so LUCKY. And after you finally figure out what kind of dog you want, that feels even LUCKIER. But when the perfect dog chooses you—it feels like you’re the LUCKIEST kid in the world! Dogs come in all shapes, sizes, and personalities. But which one is perfect for you? Kevin O’Malley is the co-author and illustrator of the popular Miss Malarkey series, as well as the author and illustrator of the state award champ Once Upon a Cool Motorcycle Dude and the New York Times bestseller Gimme Cracked Corn and I Will Share. The perfect dog for Kevin is one he can create on the page, rather than one he needs to paper train in his house (but don’t tell his dog Roxie that). He lives in Baltimore, Maryland, with his wife and two sons. You can follow him on Facebook or visit him at booksbyomalley.com.